Movie Review - 'Fruitvale Station' - Introducing Oscar Grant, The Man Behind The Headlines David Edelstein reviews Fruitvale Station, a dramatization of the last day of a man shot by San Francisco transit police in the early morning hours of New Year's Day 2009. Based on a true story, Fruitvale Station won the Grand Jury Prize at the 2013 Sundance Film Festival. 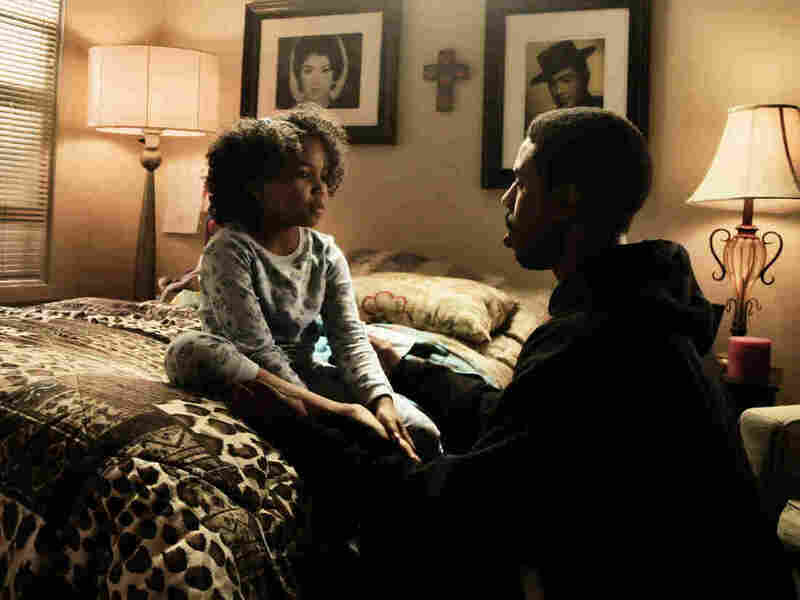 Michael B. Jordan stars as Oscar Grant and Ariana Neal stars as his young daughter, Tatiana. The actor Michael B. Jordan gives a major performance in Ryan Coogler's debut film, Fruitvale Station. He plays 22-year-old Oscar Grant, who was shot in a run-in with cops at an Oakland, Calif., train stop in the early hours of 2009. The film opens with cellphone footage of the actual event, so you know what's coming. But the Oscar you meet on the last day of 2008 remains a man, not a martyr. In Jordan's hands, he's an unstable child-man in a jittery society. He's an ex-con, a former drug dealer. His motor runs fast. He acts before he thinks. He's quick to get riled up but equally quick to turn affectionate. You can see him trying to temper himself, to grow up before your eyes. In the first scene, he's grilled by his girlfriend, Sophina, played by Melonie Diaz, about an affair with another woman. He's busted, and he knows it. But he doesn't get haughty. He tells her the relationship meant nothing, and his eyes are sharp and clear. You get the sense he really means it, that he's determined to be with Sophina forever and be a real dad to their 4-year-old daughter, Tatiana, played by a heart-wrenching cutie named Ariana Neal. Oscar wins you over completely a short time later. He's driving to work — actually, to the supermarket where he used to work before he got fired for being late too many times. He phones his mother, played with biting emotion by Octavia Spencer, who asks if he's driving, and then if he's talking on a headset. He says yes, he's on a headset — a lie. But as he's saying that, he pulls over and slides the phone over his ear into his tight cap, kind of like a headset. Lying to his mom didn't sit right. Things go badly at the supermarket, and Oscar is on the verge of dealing pot again when he remembers his mother's final visit to him in prison — and the film flashes back to that day, a wrenching one that Oscar clearly regrets. It's a turning-point moment. Director Coogler doesn't fill in the rest of his protagonist's life — how he was raised, the nature of his juvenile crimes, how he got caught and sent to prison — so it's hard to know if he has sweetened the portrait. He shows Oscar interacting broadly, buoyantly, generously with people of all races, even creating a sort of utopian multiracial community on the BART train heading for San Francisco on New Year's Eve. Most of the time, though, Coogler depicts a hypermasculine world full of dangerous corners, in which every encounter — with a store manager, an inmate, or one of the film's ubiquitous cops — has the potential to get ugly fast. Fruitvale Station is shot in black and white, its texture rough. Coogler uses all kinds of tricks — quick inserts of the subway station, a documentary-like hand-held camera — to keep this from seeming like a middlebrow message movie. The climax, when it comes, feels preventable, not inevitable. Cops arrive to break up a fight that has already ended. Oscar and his friends get down on the ground, but they're mouthy — they want the last word. The cops don't defuse the tense situation; they seem eager to escalate it. No one lets anything go. The end of Fruitvale Station — a hospital sequence, a crawl that says what happened next, some true-life footage — isn't very satisfying. But everything up to the gunshot is indelible. Coogler and Jordan have made at least momentary sense of the tragically senseless.